increases UVB & UVA output. 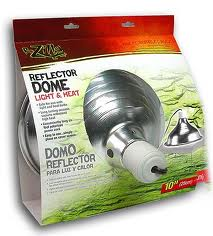 aluminum dome for maximum light and heat output. 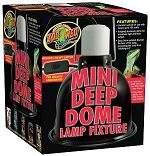 Zoo Meds most popular Clamp Lamp fixture. Made of heavy gauge painted aluminum. All models have a ceramic socket and On/Off Switch..
All models have a ceramic socket and On/Off Switch. 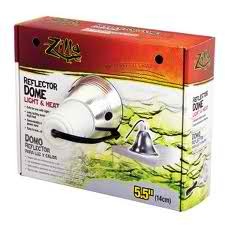 Size : 8 1/2 "
Specifically designed for the heating and light needs of reptile terrariums. terrarium. Features a Convenient on/off switch. Exo Terra Compact Fluorescent Terrarium Canopy 16" 8.0" x 3.5" x 5.9"
Exo Terra Compact Fluorescent Terrarium Canopy 18" 11.8" x 3.5" x 5.9"
Exo Terra Compact Fluorescent Terrarium Canopy 24" 23.8" x 3.5" x 7.8"
Exo Terra Compact Fluorescent Terrarium Canopy 36" 36" x 3.5" x 7.8"